BLAEU - Persia sive Sophorum Regnum. BLAEU, W. - Persia sive Sophorum Regnum. Persia sive Sophorum Regnum. 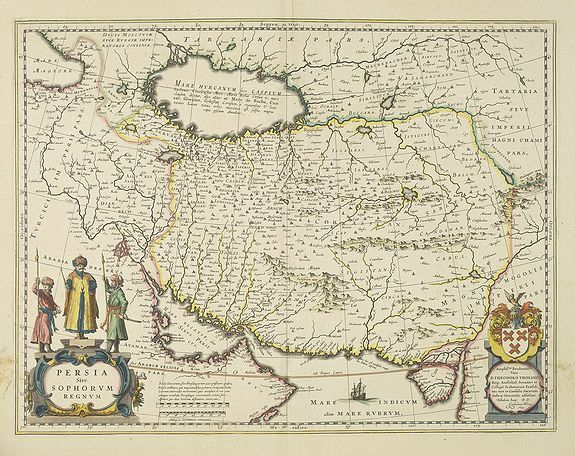 - BLAEU, W.
Title : Persia sive Sophorum Regnum.. Size : 15.0 x 19.6 inches. / 38.0 x 49.7 cm. Description :A finely designed map from the great Blaeu family of Amsterdam. With decorative title cartouche. With dedication to Theodorus Tholing and dated 1634, in lower right corner. This is the first state (of 3). As Willem Blaeu died in 1638 most of his maps are actually published by his son Joan. This map carries his (engraved) signature and was actually published in volume II of a French edition of his "Le Theatre du Monde ou Nouvel Atlas", dated 1638, therefore published the last year of his life. Condition : Light staining in left and right hand margin. Very good condition. Printed on heavy paper. Very good and dark impression. French text on verso.